I’m feeling very inspired. 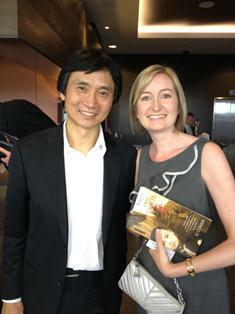 Today I met Li Cunxin, aka Mao’s Last Dancer. I was lucky enough to be invited by stockbroking and financial advisory firm Prescott Securities to a business lunch at which Li was guest speaker. Spot the book groupie – I think I was the only person in a room of 200 people who brought with me a copy of Mao’s Last Dancer for Li to sign. Many of you may be familiar with Li’s story – he was born into bitter poverty in Chairman Mao’s communist China yet went on to become a world-famous ballet dancer. Li’s story is one of courage and determination and if you ever have the opportunity to hear him speak I encourage you to do so. One minute he had the room in tears as he recalled his early years in China and his parents’ struggle to put food on the table. The next minute he had us all laughing at his first encounters with life in the West. Then we were all in tears again as Li told us of his parents’ love and their immense pride and joy in seeing him dance for the first time. He even threw in a couple of ballet moves for good measure. It was truly inspiring to hear Li speak. After all that he has been through, he remains humble and down to earth. I must admit to being a little bit star struck when I had the opportunity to meet Li after his presentation when he very kindly signed my book. If you haven’t read Mao’s Last Dancer, I highly recommend it. You can buy it here from The Book Depository*. Thank you to Prescott Securities for giving me the opportunity to meet Li and hear him speak.